Superstorm Sandy made landfall on October 29, 2012, causing 117 deaths and inflicting billions of dollars of economic damages in the United States. Two years later the economic, environmental, health and social impacts are still felt among many of the affected residents. Over 300,000 homes in New York and 350,000 in New Jersey and were damaged or destroyed by Sandy, with a substantial number of the affected homes being uninsured or belonging to low income households . Two years later, it is difficult to obtain accurate estimates of how many people have still not returned to their homes. News reports have documented the growing frustration of Sandy survivors desperate to avoid homelessness or find stable housing amid rising costs and running out of housing assistance [2,3]. According to the NYC Mayor’s Office of Housing Recovery Operations and the Build it Back Program, construction is underway in 757 homes and 158 have been fully repaired. Yet, the households that have received assistance represent only a small fraction of those in need – according to the New York Post there are 14,000 active applicants in the Build It Back program . Children are especially vulnerable in emergency situations and their performance in school and learning ability may be severely affected as a result of homelessness and abrupt relocation. Unfortunately, little attention has been paid in the media to the current conditions and outstanding needs of the thousands of children that were displaced from their homes after Superstorm Sandy . A comprehensive assessment of how many children affected by the storm have not been able to successfully return to their schools, catch up with the school material or still suffer mental and physical impacts is unavailable. Although the immediate impacts of extreme events like Hurricane Sandy such as loss of life and property have the most devastating impacts on communities and receive the most attention, they are often only a precursor to long term physical and mental health impacts that will likely affect individuals and communities for many years. For instance, mold resulting from flood damage is associated with a number of respiratory and asthma-related health outcomes . A survey carried out 6 months after the storm found that nearly two-thirds of households had mold, and 90% of those who attempted to remove the mold on their own were unsuccessful . Access to professional mold removal services is critical because self-remediation of mold, particularly in the absence of training and personal protective equipment may further exacerbate the risk for mold-related symptoms . Finally, although extreme events affect individuals indiscriminately, they have most devastating impacts on those who are already vulnerable. A recent study of Jersey Shore residents with health impairments and disabilities found that sleep problems, pain and suicidal thoughts were related to adverse mental health outcomes following Sandy . In addition, the psychological impacts of Sandy may be particularly devastating among individuals that have been previously exposed to other traumatic events, such as 9/11 . While the disaster highlighted the heroism and resourcefulness of healthcare professionals and other responders, it also exposed the great vulnerability of the healthcare system and infrastructure. In a symposium jointly held by the Kostas Research Institute for Homeland Security at Northeastern University and NCDP in December 2013, disaster preparedness experts sought to identify lessons to be learned from the Sandy experience to bolster health system and service resilience and to inform and forward a national agenda for managing the growing risk of extreme weather and other disasters . The Symposium, consisting of health systems and public health leaders, emergency managers and other experts identified several key areas for improving the resilience of the healthcare system. There was a consensus among the participants that a better understanding and management of the interconnections between the various players and domains constituting the healthcare systems is essential in preparing for and responding to future disasters. Important players and domains include the primary care providers, secondary and tertiary care facilities, home care providers, child well-being care in the child welfare system, nursing homes and adult care centers, managed care companies and healthcare regulators and standard of care centers. Since patients move into and out of the various domains during emergency situations, a better coordination among them, as well as collaborative decision-making will be essential in responding to future emergency situations. A recent governmental report on the hospital emergency preparedness and response during Superstorm Sandy found that 89 percent of the hospitals in declared disaster areas experienced considerable challenges in responding to the storm. Nonetheless, 93 percent of the hospitals sheltered in place, serving multiple functions during the storm. Patient care and staffing were identified as the two broad critical challenges reported by hospitals . 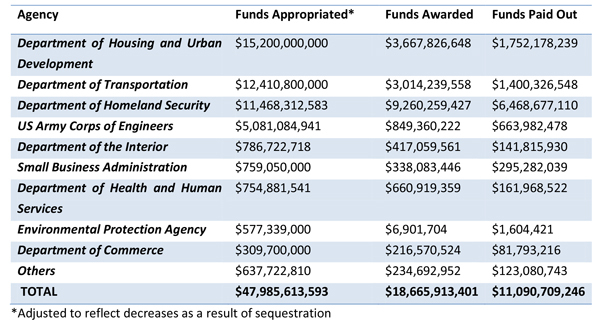 As of August 2014 slightly over $11 million have been paid out of about $19 million awarded to nineteen agencies under the Disaster Relief Appropriations Act that was passed by Congress to provide emergency disaster assistance to Hurricane Sandy survivors. This amount represents less than a quarter of the $48 billion appropriated by Congress under the Act. 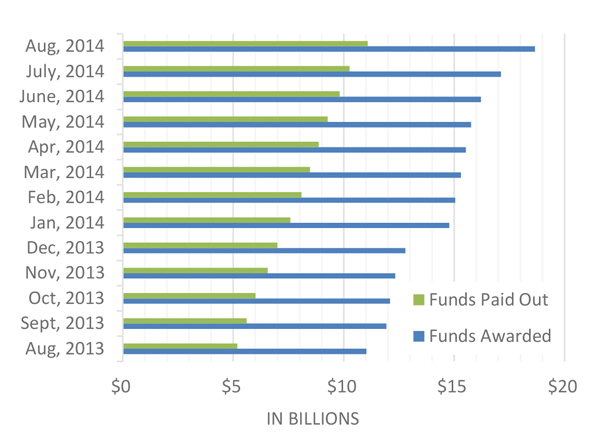 Figures 1 and 2 present data on the total funds awarded and paid out and the amounts by agency, respectively. 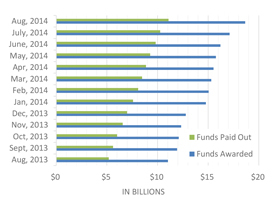 Systematic information on how the recovery money is being spent is not easily available. Funding to individuals is also difficult to track. For example, about 179,000 households in New York and New Jersey received FEMA payments for property damage or temporary housing . However, it is unclear how many of the recipients have been able to return to their homes and to what extent the needs of the affected individuals are being met. In addition, as of September, FEMA has investigated about 4,500 households for improper payments and has asked 850 of them to return a total of $5.8 million, indicating deficiencies in the management and allocation of resources. NCDP has been involved with numerous projects evaluating Sandy’s impacts on the health system, population health and well-being, environmental health impacts and disaster recovery. The Sandy Child and Family Health (S-CAFH) Study, one of the largest disaster recovery studies in the New Jersey region to date, is a joint effort of Rutgers University and Columbia University funded by the New Jersey Department of Health. The S-CAFH team is administering a face-to-face bilingual survey to a random sample of 1,000 New Jersey households affected by the storm. The major goals of the study is to investigate decision-making during the evacuation and recovery, assess long-term impacts of the storm on the health and well-being of affected children and adults, and highlight the factors and resources that survey participants have found most helpful in the recovery process. A CDC/NIOSH study focused on mold mitigation will assess the environmental health impacts of Superstorm Sandy and evaluate the effectiveness of New York City Department of Health and Mental Hygiene (NYC DOHMH) worker safety training program on the health of individuals and volunteers who performed remediation work in homes affected by Hurricane Sandy in New York City. In addition, the study will also assess the economic and social impact of the Hurricane on the households. The findings from this work will be particularly relevant to developing more effective public health interventions to minimize injury and illness following hurricanes and coastal storms. The CDC funded Sandy Public Health Systems research project will develop case studies of how two suburban health departments in the New York City region prepared for and then responded to Hurricane Sandy months after the storm, The case studies will identify challenges and obstacles these departments encountered in fulfilling their emergency response and recovery functions, related to planning, coordination, capabilities, resource allocation, logistics, and communications—problems that if addressed through education, training and other types of remediation can make these agencies (and others like them) more effective in supporting the ongoing long-term recovery from Hurricane Sandy. The project will generate and deliver new face-to-face training programs and online training products that will help these and other public health departments kick-start necessary improvements.